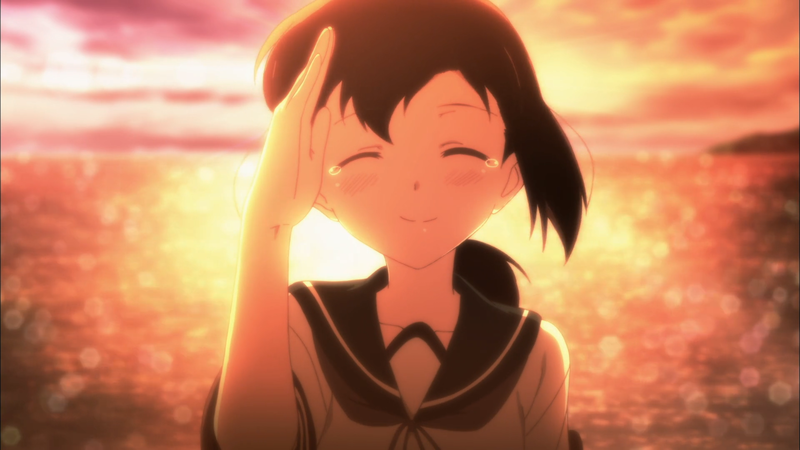 In an anime like KanColle, with all of its ships, all of its “moe,” and all of its torpedoes, there actually exists something that the audience can relate to. And that is the idea of support. Everyone needs help, from the student looking to get tutored for the next exam to the adult wanting to learn how to use the computer. We almost can’t get through our daily lives without someone, in some form, providing some kind of aid in our direction. And receiving such support can often times be both a rewarding and eye-opening experience. KanColle follows young Fubuki, an up-and-coming Destroyer Class ship looking to do what she can in a war that involves her, her friends, and her beloved Admiral. KanColle is a show that only anime could tackle; essentially, all of the girls from Kaga to Naka are anthropomorphized navy vessels, having turned from venerable war machines into really cute girls. 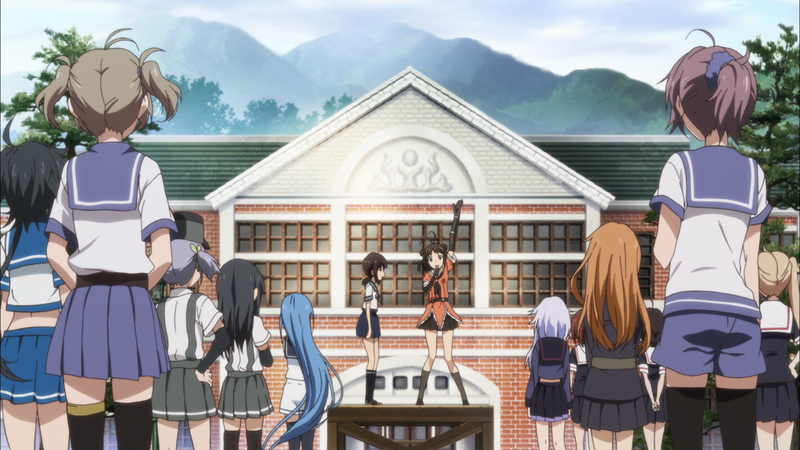 While technically a “Military” genre anime, the show is mostly a slice-of-life offering, aiming to showcase the girls at various points in their training, lives, and careers as battle cruisers. And for the most part, the anime is able to pull this off. One tactic used to accomplish this goal is by divvying up the screen time for the majority of its cast. While Fubuki garners the most limelight, the show often times splits characters into respective groups, and even occasionally changing said groups up. In this way, the anime gives the audience the chance to watch their favorite ship do everyday things, from bathing, to eating, and even cooking. Another tactic is in the very nature of a militarized zone: each girl is relegated to specific tasks. 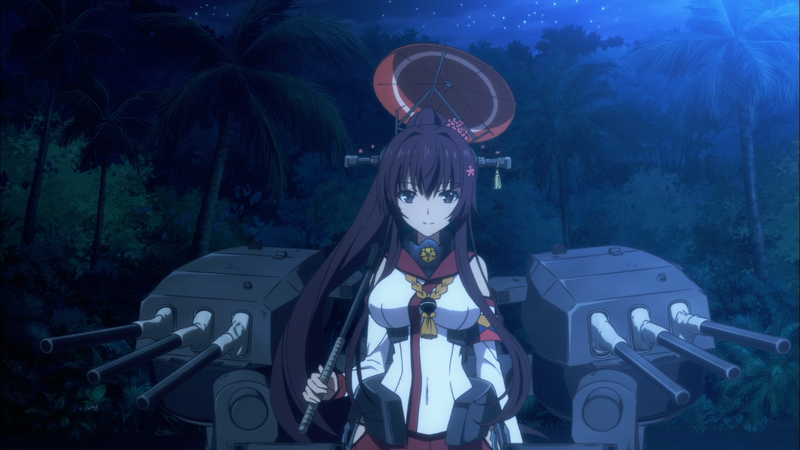 While the majority of the girls are designed for battle — Akagi, Kongou, and Yuudachi come to mind — some are designed for other, more nuanced tasks. For example, Nagato is the overall leader, Yamato has her own “hotel,” and Hibiki is used for collection. By separating the ships into further, more specific roles, when the anime naturally transitions from one location to the next, so do the characters involved. The slice-of-life antics only make up about half of the anime; the other half moves into the aforementioned military facet. Here, the various girls actually start to be the very war vessels they actually are. It’s at this point the show really begins to suffer. KanColle would like these battles to have any significant meaning attached to them, but sadly there isn’t any to be had. While a wide range of girls receive attention, the amount isn’t enough to constitute a connection deep enough to warrant their predicaments worthy of drama. Instead, it feels lacking, forced even, that the girls are placed within these situations. And such a feeling also comes from the purpose of the battles themselves; the victory never does anything. They may fight for an island or protect a strategic location, but the outcomes of the fights are always the same: win, go back to base, and wait for the next skirmish. Among the cuteness and firepower, KanColle does at least attempt to have some sort of thematic presence throughout its run. “Attempt” is the operative word, because the show somewhat fails at doing so. It sticks to the general and tired themes that most cute anime strive for: dealing with hardship, learning to accept others, and fighting against destiny. Nice little motifs, and certainly insights that one can take to heart, but none are looked at extremely seriously and only there for the structure of the anime. Think of the themes as a stack of paper; one piece is pulled from the stack and used to hold the show up. But since it’s just one piece of paper, it breaks under the weight it is holding. Yet before it falls, it is held up by the next piece of paper — the next theme — only for the process to continue repeating indefinitely. It’s not until the entire stack is placed underneath that the anime is prevented from falling. This interconnected support is literally just that: a theme of support. For while each individual, fun message is fine, what they all have in common is this idea of supporting one another, no matter the circumstance. And that’s something that is not only consistent throughout the anime, but makes sense in context; whatever kind of military it is, supporting each other is the number one goal. 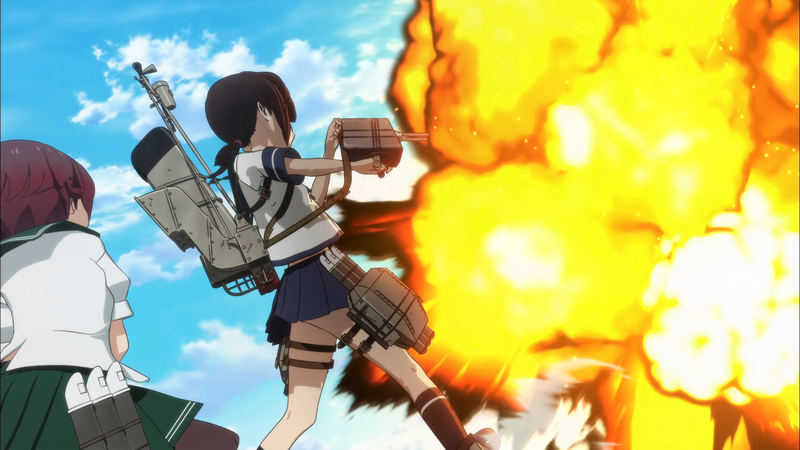 KanColle is a mixed bag when it comes to its art and its animation. The art for the show can actually be quite nice at times, but it largely depends on location. When the girls are at home base, the track field, mess hall, and dorms may not be detailed exquisitely but it still looks rather pretty. Yet, just like the move from slice-of-life to military, when the girls move onto the water, all of that art disappears. It’s replaced with a lot of sky and ocean, with such a replacement losing any flair the show may have generated. The character designs for each of the ships are nicely done. The girls are given unique outfits depending on the character — Yamato has her umbrella, Shimikaze has her bunny ears, and Atago has her blue pilot’s outfit, to name a few. Furthermore, they each have their own, specialized weaponry to go along with their persons. Depending on the class and the size of the girl, their cannons match accordingly. When it comes to actual animation, it’s a bit of a toss-up. When the girls are on their missions, the use of CG isn’t too jarring, but the use of their weapons and the maneuvers they pull off aren’t anything extraneous. It’s usually them standing still, one arm out, and a bunch of smoke that covers the screen. When they’re not out on the water, their casual conversations and simple motions are still of the same complexity; quite average. KanColle contains quite the large cast. The majority of the characters don’t see significant progress, but here it’s prudent to take a look at three of the most important from the show: Fubuki, Yamato, and Mutsuki. Taking the lead, Fubuki is the average main character. She’s kind and intelligent, but it’s obvious that her skills are far lower than the others in the troupe. She struggles and fights to earn her place among their ranks, wanting to prove to herself and to everyone that she is capable of being the Destroyer that she is. This drive, this incessant need to bemore than she is, is what the Admiral sees in her that the rest cannot. It’s not so much that she has the largest guns, or can fire the biggest torpedoes, or has the greatest accuracy. What she provides is something intangible, something that not a lot of people immediately have. And that’s courage. The courage to train from morning to night without rest. The courage to face your faults, to fix your mistakes. The courage to take a chance rather than holding back. And in this way, her fortitude gives her not only the ability to lead those around her but also support the very ships she calls friends. So while she may be the stereotypical hero, her exemplification of the underlying theme of the anime marks her as at least being slightly more than generic. In a stranger position is Yamato. Her enormous firepower makes her the fleet’s secret weapon. But because of this, she’s kept hidden away, unused in battle and forced to toil on an island that rarely gets visitors. She feels both lonely and worthless for these reasons, which, in a rather interesting way, makes her Fubuki’s previous self. For Fubuki was in the exact same position; on the outside looking in and not being able to work with the girls she had come to respect. And so Yamato learns from Fubuki. She sees her determination, drive, and dedication at doing whatever it takes to fix the situation at hand. This instills in Yamato her own sense of purpose; that while she may be constrained to a more unique role, that doesn’t mean she isn’t valuable in some form. Thus Yamato gains her own kind of courage, showing up when the going got tough and proving to the girls and to the audience that everyone has a purpose. Perhaps the strangest of the ships, though, is Mutsuki. She’s overtly sweet, always shouting niceties and aiding the friends around her. What’s interesting is that she is rarely seen in battle; she makes a few appearances, but her prominence is her location outside of it. And that is usually in a flower field, near a shrine, or at the pier, where she is most often found believing in the aptitude of the ships at sea. She’s not particularly noteworthy for her battle prowess, nor is she famous for being one of the cuter girls. In a way, she acts the most human, praying, wishing, and wanting the girls to perform to the best of their abilities, cheering from the sidelines rather than being the very vessel she is known to be. She experiences difficult times — the loss of the girl she looks up to — which tests her will, but, in true Fubuki fashion, Fubuki gives Mutsuki the courage necessary to continue believing in the ships around her. For nobody goes through life without problems, thus making how you deal with those issues to be the most important lesson. The OP contains quite the strong singer, whose vocal power carries the entire track from start to finish. The hard guitar and drum beat work nicely in unison, and help to support the vocalist throughout. The lyrics and tune can be catchy at certain points, though it is still an overall alright piece. Once again, the singer takes center stage in the ED. Although here, it features something weird: fast, catchy lyrics. The song is at first not that good of a listen, but after hearing it a few times, one gets used to the guitar, chimes, and quick singing, making the piece the stronger of the two. The soundtrack often fits the mood for the show, depending on whether it is partaking in the slice-of-life or military genres it falls under. The former usually uses piano and violins for those everyday sounds, and a single-drum for that training feel. The military aspects, in contrast, incorporate orchestral music for a more resounding vibe. Trumpets and violins work overtime during these scenarios, making the fights gain a heightened feeling of importance. Also of note are the cannon, gunfire, and ocean sound effects that give the battles further realism. When it comes to anime, I’m a fan of cuteness. And while not all of the girls were fun to watch on-screen, some were quite entertaining to see. My favorites from the show were Yamato and Nagato for their attractiveness, while Oochi and Kitakami’s relationship nearly always got me to laugh or smile. 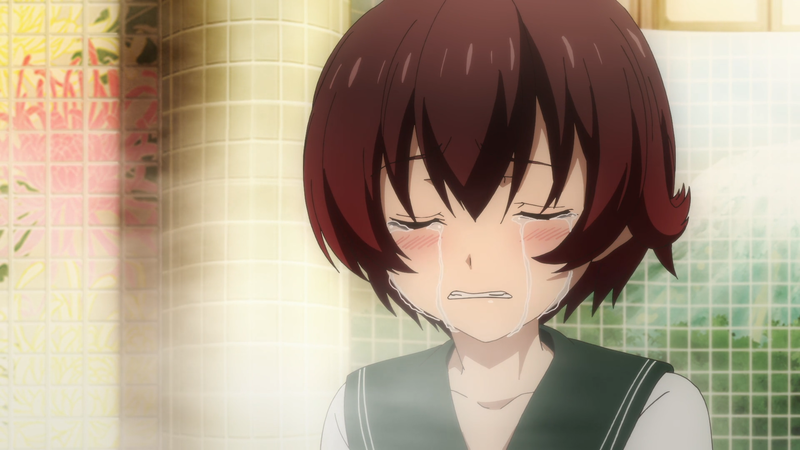 On the other hand, though, I despised Mutsuki. Just the combination of her voice and her extreme sweetness had me wanting her to leave the screen as quickly as she appeared. That’s pretty much it in terms of enjoyment. The rest of the girls are alright, and there can be some cute moments here and there, but there is nothing entirely memorable. 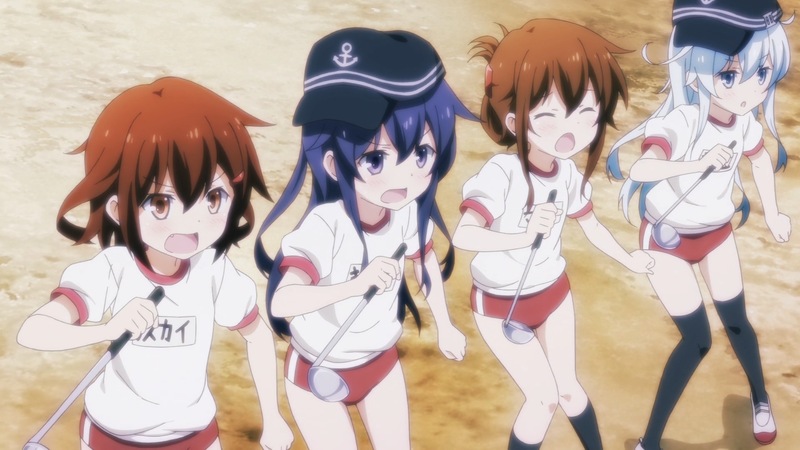 The actual battles, watching the girls at sea fighting against the enemy, were where the anime really began to lag. Instead of seeing the “cute girls being cute,” I was instead treated to warfare that wasn’t all that impressive or fun to watch. A lot of screaming, a lot of explosions, but zero adorableness. As an anime, KanColle does what it set out to do. Its average story and characters are backed by a good amount of cuteness and some interesting sound work, making the whole package an alright experience. At the end of the day, though, there isn’t much more to it than that.